Take command of the most advanced forces in the galaxy, and battle for supremacy in Battle for the Galaxy Game! Battle for the Galaxy is an exciting mixture of base building, resource management, and strategic combat. Build your base and create powerful upgradeable army. Attack enemies to earn medals and steal their resources. Band together with other players to form a clan, and compete with other clans to rule the leaderboards. Battle for the Galaxy Game is a browser based real time strategy war game. Where you play the role of a commander of an advanced army. So build your base, gather resources, expand your army, and participate in a strategic combat and wage war for supremacy. You may also upgrade your units or create defensive towers to further expand and defend your territory. Attack your enemies and plunder their resources to earn medals. Band together with other players in Battle for the Galaxy Game and form alliances, corporations, and guilds. Compete with other player-created teams to rule make to the leaderboard and prove dominance! 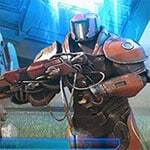 Discover, explore, and build on a new planet and protect it from invaders in this awesome futuristic real time strategy game – Battle for the Galaxy! So build an Outpost and start training your army and prepare to wage war!